A lot of people decide to visit Thailand for its astonishing beaches or secluded villages in the north, but if you are planning your trip to Thailand I really think you shouldn't miss a visit to Bangkok, it will totally surprise you and I'm going to tell you how ! Thailand is well know for being home of a huge street food tradition, but when you are travelling as a vegan you never know what to expect. As soon as I arrived in Bangkok I rushed outside my hostel to explore the area and see where I could possibly eat in the next days. It was new year's eve so many street stalls were not open, and I decided to try the malls around Siam . At first I got quite worried because I didn't see all that vegan food I heard about, so I ended up eating at an Indian stalls...only a few days later I discovered with much surprise that every food hall inside a shopping center usually has at least a vegan (or JAY, which means vegan food without onions and garlic) food stall, but are will not able to recognize it as it is often not marked, and the fake meat they serve looks actually like real meat. 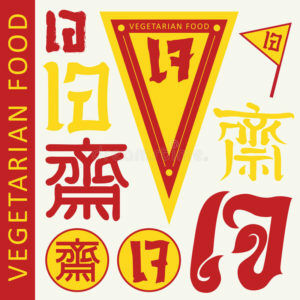 Once in Bangkok you may notice that not everyone speaks enough English to understand what "vegan" means, and they won't understand your pronunciation of JAY, so you should print this symbol or at least have it on your phone, it's the Thai word for Jay. 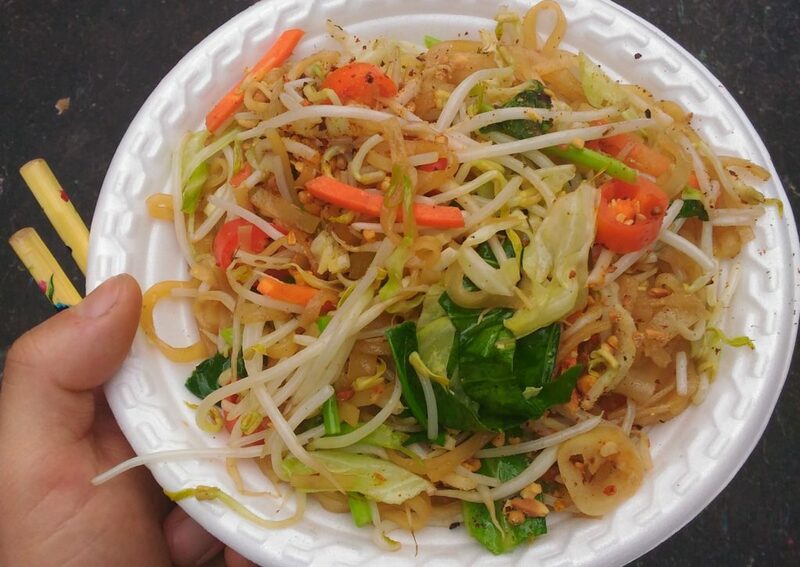 As far street food is concerned, it is not difficult to find a vegan or veganizable dish: you'll have at least rice or noodles with veggies and tofu almost everywhere. Once you have learned how to make people understand what you want, you'll be happy to see how good and how cheap street food is in Thailand. One of the aspects that I take into consideration when I choose my destinations is their local transportation...it would have no sense buying a cheap flight for a place where I can move only with expensive taxis, so Bangkok was perfect for my standards. Moving around Bangkok without taking a taxi is not only possible but also really easy and cheap. I suggest you buy a local sim card to have access to the internet, it will make it really time saving to check bus/boat routes online: I didn't have it at the time as I was not going to stay long in the city, but I really regretted it. - Sky Train: a super efficient system of suspended trains that will take you to the main destinations around town; always take a sweater with you, inside the train it's freezing cold. The Sky Train line is also super useful if you get lost around downtown, once you see the trails above you're head you know where your are at. - Boat: that is my favourite way to move around the city: not only you can take the big boats on Chao Phraya river, but also small boats that you can grab to go from downtown to the old city. This little boats use the small canals that run across Bangkok. They have many peers scattered everywhere and a (more or less) fixed schedule. I loved taking boats because I could travel slow and see an intimate aspect of the area that would have passed unnoticed on other means of transportation. - Underground: I used it just a couple of times and I found it totally reliable and comfortable. You need to purchase a coin to access the trains, but machines are just there and easy to use. Here's the map of the lines. - Local Bus: this is the most complicated but also the most widespread of the transportations in Bangkok. As I didn't have internet access it was really difficult to know which was my stop or where I could take a specific line..however..I asked around and I didn't get lost. Anyway, if you have the internet you will totally avoid the issues that I had. Buses run everywhere in town so you can go almost everywhere you want...but beware: Bangkok is not only famous for its food, it's also famous for it's tremendous traffic, so you can get stuck somewhere for quite a lot of time. If you like both modern and ancient architecture, then this city is perfect for you. EAST: here lays downtown, with it's skyscrapers, offices, malls. 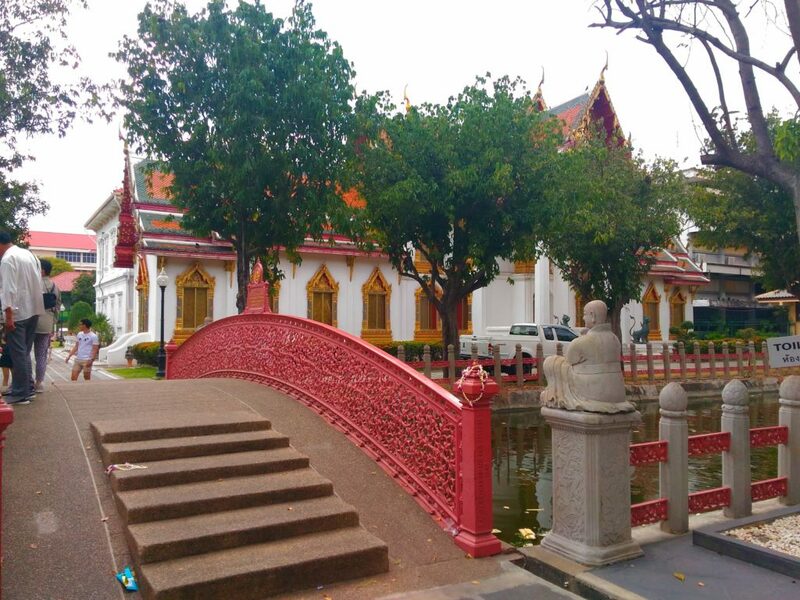 If you need to take a break from the city you can also have a walk in Lumpini Park. WEST: this is the area of the ancient town; if you like visiting temples you'll spend a huge part of you holiday here. Not only you can visit the Royal Palace, But also Khao San Road, famous for its shopping and food scene, or Wat Intharawihan, where you can see one of the tallest standing Buddhas (and eat delicious fried and sweet tofu). On the contrary, if you are more of a city and night life person, and you don't mind using taxis, you should find an accommodation downtown; a friend a mind choose this hotel and enjoyed it a lot, but don't expect it to be cheap!